Soul Kitchen kohteessa Pietari, Venäjä: Varaa nyt! Super place to stay at night, lovely beds and atmosphere. Clean , warm and good peoples suround. Amazing! 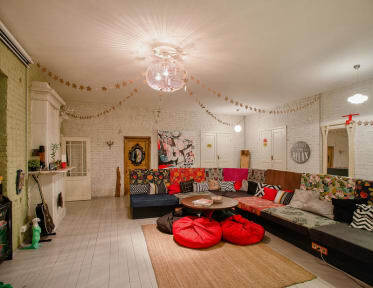 I have been staying in hostels all over the globe, and yet we believe with my boyfriend that this hostel has been by far the best! Reception girls where very friendly and helpfull and spoke fluent English. Hostel decoration is super cool and the room was nice and clean. Even sheets where comfy. The hostel is supplyed with pretty much everything and they are not over charging. Will definitely stay here again and recommend this for anyone who's coming ton SPB.